Thanks Johnners - and thanks Aggers. Johnners would have loved it. Brian Johnston was a man of comparatively simple pleasures and all were present in abundance at the launch party last night of the new book about him by Jonathan Agnew – “Thanks Johnners”. There were Thesps and entertainers galore: Simon Williams, Roger Lloyd Pack, Tim Rice, Lesley Garrett… his old friends from Test Match Special like Christopher Martin-Jenkins and Peter Baxter as well as, of course, the Author himself – young Aggers. But above all there was family – the Agnews and the Johnstons en masse including Jonathan’s octogenarian parents and Johnners widow Pauline – frail at 88 but with that sparkle in her eye that must instantly have attracted BJ to her when they met way back in 1947. Stephen Fry, who wrote the Foreword to the book, would also have been there but sadly had to attend the funeral of an old friend in Chester. The unique charm of Brian Johnston is well summed up in Stephen Fry’s contribution to the book “Charming, gallant, funny, courteous, kindly, perceptive, soldierly, honourable and old-fashioned” - old-fashioned in the right way Fry stresses! Everyone at the party had at least one personal Johnners story and each of these confirmed Fry’s assessment of the character of the man. As a schoolboy, back in the early 1960s, I brandished a copy of one of Johnners’ early tomes in front of him for his signature. He looked at me with faux astonishment “Good Lord you actually bought it!” he said. I must leave an assessment of Aggers new book until I have actually read it – but the signs are promising. I remember when the word leaked out that Agnew had been commissioned to do the book Andrew Johnston, Johnners second son, looked a little doubtful as there had already been a number of very good biographies of his father by Tim Heald, by Johnners’ eldest son Barry as well as BJ’s own various autobiographies and memoirs. But the Johnston family seemed very happy with “Thanks Johnners” and Jonathan Agnew thanked them generously for their cooperation. Johnners was above all an entertainer and that is a rare thing in sports commentary today. How many writers and correspondents on sport write or talk first about the politics, the money and the darker side of our national sports? Even Aggers, solidly and commendably in the Johnners tradition of entertaining commentary, had to deal all too often this summer with the seamier side of cricket -match-fixing and the like. His distaste for all this was evident but his professionalism in tackling it, which as BBC cricket correspondent he had to, was commendable. Many cricket fans would argue that cricket is different in that it is rarely predictable who is likely to be an enthusiast for the great game. The theatrical connection is long-standing - even Hollywood has a cricket club going back to the 1930s founded by the actor C.Aubrey Smith - who had played one Test match in 1889. 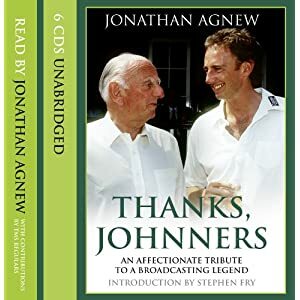 The eclectic nature of the support for the game was shown by the guests at the book launch many of whom has been on TMS’s “View from the Boundary” - originally an interview spot conducted by Johnners and now one of Jonathan Agnew’s favourite parts of the programme. That’s why Lesley Garrett was at the party. By coincidence I had seen one of Ms Garrett’s concerts last week in Liverpool Cathedral, of all places, where it was the highlight of a Pensions conference! She seemed very surprised that there was someone at the book launch who had been at the Cathedral - but she was charmingly pleased that I had enjoyed it so much. Lovely lady! There is a continuity of style about Test Match Special that enthusiasts like me treasure. The torch has been passed almost effortlessly it seems, from hand to hand: Alston, Swanton, Arlott, Johnston, Mosey, Blofeld, CMJ and now Aggers. None of these great commentators were star cricketers – though Blowers might have been and Agnew was better than his three Test matches and three ODIs record suggests. But what they all have is the special ability to talk to the listener so that it is almost as if the commentator is sitting next to him in a deckchair at the match. On Sky TV we do get very insightful comments from their gaggle of ex-England captains but there is rarely the segue into fantasy that has always been part of TMS’s style. And there is never the geniality and the hospitality either – I doubt that the Sky box is a very welcoming place whereas the TMS commentary box is always an attraction – and not just for the cake. Aggers expressed his real concerns last night about where the new TMS commentators are going to come from. There are few training grounds any more with commentary on domestic cricket having almost completely withered on the vine. Blowers is 71, CMJ is 65 and even Aggers is 50! True Johnners carried on well into his eighties so we can hope that the “A Team” will be with us for some time to come as well. But isn’t there somewhere an embryo Johnners or Aggers waiting for his or her chance? Don’t tell me we don’t make them like that anymore!